The first running of the Aldiss Furnishing Stores Handicap Hurdle has attracted a field of seven for this afternoon’s always popular Fakenham seven-race Easter meeting. The three-mile trip on the good ground should ensure a strong gallop and the race, at 4.05pm, could go to Bazarov under Brodie Hampson for trainer Archie Watson. Watson, based at Upper Lambourn, is making a big name for himself on the flat. But Bazarov was his first National Hunt winner when landing a similar contest at Hereford at the end of March. However, it is a competitive event with Jamie Bargary on board the Shaun Harris trained Hear The Chimes, a Huntingdon winner in February, while Daryl Jacob takes the mount on Dr Richard Newland’s Desert Sensation, third at Wetherby last time. Nico de Boinville rides the mare Scented Lily for Charlie Longsdon, while Peterborough-based Pam Sly sends out Kielan Woods on Acertain Circus, a Market Rasen winner a month ago. Feature race is the £30,000 David Keith Memorial Veterans Chase at 3.30pm in which five go. Harry Skelton rides for brother Dan on Value At Risk, third at Ayr last time while Neil King has Rex Dingle claiming five pounds off Vaxalco, twice a Huntingdon runner-up this year. A quarter contests the opening novice hurdle at 1.45pm which could go to Zoffany Bay under Andrew Tinkler for Ali Stronge, the gelding second in his last two outings, at Fakenham a month ago and at Catterick. Another quartet goes in the 2.20pm Hunter Chase for the Robert Hoare Memorial Trophy which should be between Tabitha Worsley’s mount Cyrius Moriviere and Llancillo Lad, formerly with Robert Walford. Biggest field of the day sees 10 go in the 2.55pm Cecil and Sheila Buttifant Memorial Hurdle with Alain Cawley partnering John Ryan’s Generous Jack, a Fakenham winner in February. Jacob on Luke Dace’s Ravenous and Alan Johnson on Welsh trainer Tim Vaughan’s Southwell winner Glimpse of Gold, look key rivals. Terry Redhead’s Selections: 1.45pm Zoffany Bay, 2.20pm Cyrius Moriviere, 2.55pm Glimpse of Gold, 3.30pm Value At Risk, 4.05pm Bazarov, 4.40pm Italian Summer, 5.15pm Sir Jack Yeats. 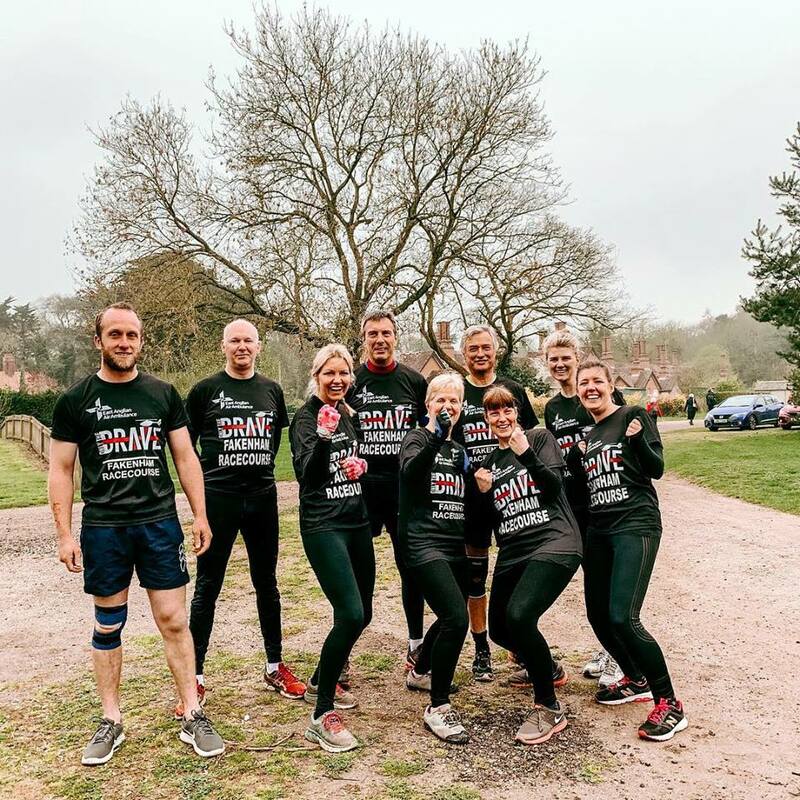 Fakenham Racecourse directors and staff took part in The East Anglian Air Ambulance (EAAA) challenging mud race ‘Only the Brave’ which took place at Elveden Estate, Norfolk on 7th April 2019. The team of nine participants an impressive total of £21,088.64 (plus gift aid) for EAAA. In part, the inspiration for those taking part in the racecourse team was the first hand experience of EAAA being involved in two separate incidents at the racecourse over the past 12 months. On both occasions, a member of the public suffered a cardiac arrest and because of immediate first aid followed medical intervention of the highly skilled and specialist team of the air ambulance both men survived. The team that consisted of Adam Case (Chairman of the Racecourse), Nigel Savory (Racecourse directors and trustee of EAAA) and members of staff, Trudi Moulton, Clare Beevers, Dalia Courridge, Vicki Harper, Matthew King, Rachel Symington and Tristan McEwan. Some of the team opted for the 6 mile challenge, whilst Adam, Matthew, Rachel and Tristan braved the 10 mile race. Both teams managed to complete the race in less than 2 hours, which was no mean feat, especially given the cold day and pouring rain at times. East Anglian Air Ambulance (EAAA) is a community funded charity that provides a life-saving helicopter emergency medical service (HEMS) for the people of East Anglia. The charity has two helicopters and two rapid response vehicles, which are located at their Norwich and Cambridge bases. Each of their crews consists of two pilots, a doctor and a critical care paramedic. The crew take advanced critical care directly to patients who have suffered life-threatening or life-changing accidents or medical emergencies. The starting cost of a mission is £3900. 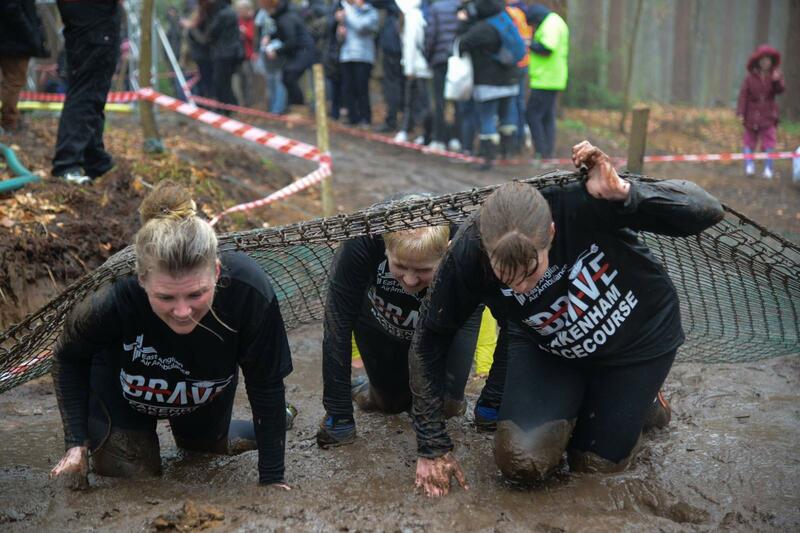 Only the Brave had a terrific vibe and was great fun to part take in, especially whilst raising the funds for such a worthy cause. If you would like to find out more about the East Anglian Air Ambulance and the brilliant work that they do, please visit their website https://www.eaaa.org.uk/ or find them on Social Media. For those wishing to donate and support the racecourse fundraiser, you can still donate on their Just Giving Page . A £30,000 three-mile handicap chase for veteran horses is the feature of Fakenham’s seven-race card on Easter Monday sponsored by Aldiss. The course’s most popular race day has attracted an original entry of 11 for the 3.30pm David Keith Memorial Veterans Handicap Chase, including Newmarket trainer Lucy Wadham’s Le Reve. A winner at both Sandown and Lingfield earlier this year, Le Reve was fourth last time at Kelso and faces strong opposition, particularly from the Neil King trained Princeton Royale. An Ascot winner in March, Princeton Royale is no stranger to the north Norfolk course, having won in June last year and having been placed four times at Fakenham last season. Kayf Blanco is another useful contender, the Graeme McPherson trained gelding fourth at Kempton having won at Fakenham mid-February. With races at Fakenham on Easter Monday since 1904 there is a strong chance, having set up his first store in 1892, the original W J Aldiss would have attended. Now 115 years later, the current Aldiss family has its name associated with the Easter race day. Current Aldiss chairman, Tim Aldiss, will attend a week or so after his 80th birthday and will lead the presentation party for The Aldiss Furnishing Stores Handicap Hurdle at 4.05pm. There are 26 original entries for the three-miler which sees Jane Williams’ Germain go for a hat-trick after wins at Wincanton in March and April. Acertain Circus for Peterborough trainer Pam Sly won at Market Rasen in March while Shaun Harris has Hear The Chimes, second at Haydock after winning at Huntingdon, in the provisional line-up. Two last time out winners are in the list for the opening novice hurdle at 1.45pm with Oliver Sherwood’s Dominateur, a Carlisle scorer, and Dan Skelton’s Monsieur D’Arque, having won at Ludlow albeit over a shorter trip. Skelton has So Lonely entered in the 2.55pm Cecil and Sheila Buttefant Memorial Handicap Hurdle following a Huntingdon victory while Christian Williams has Lace Bonnet, the grey mare having won at Warwick in April. The closing bumper is at 5.15pm with Skelton’s Bergamot, second at Taunton in April, and Vienna Court, Nigel Twiston-Davies’ filly, two of major interest. The other two contests are hunter chases with the Robert Hoare Memorial Trophy the prize at 2.20pm and the Queen’s Cup going to the winner of the 4.40pm. James Bowen, 18 last Tuesday, was the star of the show at Fakenham, taking the race of the season, the Fakenham Silver Cup, to compete a hat-trick of victories. Bowen, son of trainer Peter from Haverfordwest in Wales, was in superb style and completed his treble when grey gelding Thistimenextyear fortunately landed the £18,000 feature race. Potters Midnight, last year’s winner from Lucy Wadham’s Newmarket stable, looked like completing the double when she led at the final hurdle. However, the mare made a complete mess of the flight and left the way clear for Thistimenextyear to score at 5/2. “I’ve been a bit lucky. I don’t think I’d have won if the other horse had jumped the last well,” admitted Bowen, although trainer Richard Spencer thought otherwise. “I was on the inside of the track and Thistimenextyear was closing. We’ve been brushing up his jumping at home and he’s done well,” said Spencer. While Bowen had plenty to celebrate he probably wasn’t looking forward to going home to see dad. Bowen partnered the Christian Williams trained Sideways to success in the Prince Carlton Chase, the 10/11 favourite just getting the better of the outsider of the field, Henryville, trained by his father Peter. It was a stirring finish as Bowen got Sideways, a winner at the course on New Year’s Day, home from Henryville who defied his 20/1 odds. “He was in front a bit early but he has a good profile and is improving. It was a nice prize and he deserves it. He’s done plenty of racing so it may be time to give him a rest to look forward to next season,” said the trainer. Bridgend-based Williams has been enjoying plenty of Fakenham success this season and his Cap Du Nord, again under Bowen, won the Fakenham Staff Fundraising Run for Air Ambulance Chase, his third successive victory. Nobel Leader looked a big danger to Cap du Nord but a jolting jumping error followed by another poor leap at the final fence left Williams’ six-year-old gelding to score in style, returned the 11/8 favourite. “He finished off very well. I must think now about stepping him up in grade,” said Williams. There was more last fence drama in the Walter Wales Memorial Novice Chase. Primal Focus, bidding to land trainer Williams with a treble, led going to the last but crashed out leaving Stonebrigg Legend, under Ben Poste to score at 5/2. The mare, trained by Sarah Humphrey, had won at the course’s last meeting 11 days earlier … beating Primal Focus. Olly Murphy had the first and second in the Robert Case Memorial Maiden Hurdle when 11/10 favourite Swaffham Bulbeck, three times a runner-up, finally got his nose in front under Cillin Leonard, a 10-pound conditional clocking up his first winner in Britain. Swaffham Bulbeck took over from Grand Inquisitor and then held on to beat fast-finishing hurdling debutant and stable-mate, Emerald Rocket. The Gary Moore trained Clayton was delivered perfectly by seven-pound conditional jockey Niall Houlihan to take the opening selling hurdle, returned at 13/8. Clayton moved past long-time leader and 5/6 favourite American Tom before the final flight and ran out a comfortable winner by a length. It was Houlihan’s second trip to Fakenham and his first winner at the course. The closing Hunters’ Chase completed a double for trainer Spencer when Sir Jack Yeats, at 5/4, easily scored under James King. Less than20 minutes after the highlight of the National Hunt season, the Cheltenham Gold Cup, Fakenham stages its Silver Cup, the feature of a seven-race card tomorrow, Friday, March 15. The big screen means all the action from Cheltenham will be available for racegoers. The 3.55pm Silver Cup, featuring eight runners for the two-mile contest, is worth almost £11,000 to the winner. James Bowen rides the Richard Spencer trained grey gelding Thistimenextyear, fourth at Sandown in January, while Peterborough-based Pam Sly legs up claimer Paul O’Brien on her seven-year-old mare All My Love, a Lingfield winner. Lucy Wadham runs Potters Midnight under Jack Quinlan, the mare third at Market Rasen in February while at the bottom of the handicap, Lazarus, representing Amy Murphy, has a seven-pound claimer to help his cause following a recent second at Doncaster. Chasing fans are in for a treat. At 1.55pm six go in the Fakenham Staff Fundraising Run for the Air Ambulance Chase which sees two rivals bidding for hat-tricks. Christian Williams has Bowen on Cap Du Nord, twice a Sedgefield winner while James Evans has Ben Poste on Nobel Leader, a winner at Huntingdon and Bangor. The 3.15pm Prince Carlton Chase over three miles sees Williams with Sideways, a winner at the track on New Year’s Day. Bowen again takes the ride. Main danger looks to be Dan Skelton’s Set List, the gelding second at Fakenham last May, a break of 311 days. Six go in the Walter Wales Memorial Novice Chase at 4.35pm in which Stonebrigg Legend and Primal Focus, first and second at the last meeting at Fakenham, clash again. However, they may find in Come on Charlie from the Philip Hobbs yard a tough opponent. The finale, the open hunter chase, features Zeroshadesofgrey for Charles Buckle and trainer Rob Cundy. The grey was runner-up at the course in February when returning from a 306-day break. Swaffham Bulbeck, under Cillin Leonard for Olly Murphy, goes in the 2.35pm Robert Case Memorial Maiden Hurdle, attempting to better a recent third over course and distance, while in the 1.20pm opening selling hurdle, Generous Jack, for trainer John Ryan, bids for a three-timer after wins at Fakenham and Plumpton. There is a huge initial entry of 118 runners for Fakenham’s Silver Cup meeting on Friday, (March 15) the same afternoon as the ‘Blue Riband’ of the National Hunt season, the Cheltenham Gold Cup. Spectators at the seven-race meeting in north Norfolk won’t miss a minute of the top action from Cheltenham with all races shown love on the big screens. Fakenham’s card starts at 1.20pm with the final race off at 5.10pm on one of the course’s top days of action. The 3.35pm Fakenham Silver Cup Handicap Hurdle is an £18,000 contest with 29 entries at the initial stage. They include Caroline Bailey’s six-year-old mare Dyliev, bidding for a hat-trick after winning twice at Huntingdon in the last three weeks and Gary Moore’s 10-year-old gelding Clayton, looking to go one better than two second place finishes at Lingfield in January. There are also two £14,000 races on the card. At 1.55pm the Fakenham Staff Fundraising for Air Ambulance Handicap Chase sees two entered bidding for hat-tricks. Christian Williams had six-year-old Cap Du Nord win twice recently at Sedgefield while James Evans’ nine-year-old Nobel Leader won at Huntingdon in February after undergoing wind surgery after having previous tasted victory at Bangor. The other £14,000 race is the 3.15pm Prince Carlton Chase in which Nigel Twiston-Davies has Ballykan, second at Wincanton a month ago having been in the same position when running at Fakenham in October. Williams has another former Fakenham winner, Sideways, in the line-up. A selling hurdle opens proceedings at 1.20pm with John Ryan’s Generous Jack looking for a hat-trick after a win over course and distance in February and success at Plumpton in January. The Robert Case Conditional Jockeys’ Maiden Hurdle at 2.35pm sees Fakenham regular Olly Murphy with two entries who would be making their hurdling debuts. They are Emerald Rocket and four-year-old Redemptorist, a runner-up on the flat at Chelmsford five weeks ago. The Walter Wales Memorial Novice Chase at 4.35pm has a entry from Philip Hobbs’ stable in Come On Charlie, a December Musselburgh winner while Stonebrigg Legend and Primal Focus, first and second at the last Fakenham meeting, are entered again by trainers Sarah Humphrey and Christian Williams respectively. The Fakenham Open Hunter Chase is the 5.10pm finale with Silvergrove, a four-time point-to-point winner and Zeroshadesofgrey, second at Fakenham in February, among the line-up. Talented teenage jockey James Bowen got home in the final strides on grey gelding Fifty Shades, to win the three-mile Fakenham Supports Racing to School Handicap Chase during a dramatic day at Fakenham. Bowen was riding the Christian Williams trained six-year-old, turned out quickly after finishing second at Catterick last week. Midnight Bliss for Wymondham trainer Caroline Fryer set the early pace but was overtaken by Sackett. He looked a winner until Bowen delivered Fifty Shades perfectly to score by half at length at 11/4. “He’s finished strong and jumped well at the last and landed running. It’s another good win for Christian whose horses are in great form,” said Bowen. The race was run after a delay of 45 minutes following a medical emergency which saw a racegoer taken to hospital by air ambulance. During the race amateur jockey Ben Brackenbury suffered a hefty fall from Tinker Time and received lengthy treatment on the track before being taken to hospital with a suspected fractured sternum and broken ribs. The feature race, the Fakenham Skips Handicap Hurdle was a thriller and went to Canyon City under a superb ride from Bryony Frost. The 9/5 chance was third at the last flight but a great leap saw Frost switch the gelding to the outside where he got the better of long-time leader Kilbrew Boy and eventual runner-up Uno Mas. “I told Bryony to stick to the inner so I got that wrong! It was a great ride and a good race. My horses are in cracking form at the moment,” said victorious trainer Neil King. Leighton Aspell, fresh from a Saturday big race double, continued his hot streak in the opening Barnham Church of England School Maiden Hurdle when hurdling debutant Arch My Boy easily accounted for eight rivals. The Martin Smith trained five-year-old took it up two out to score by nine lengths from pacesetter Zanzi Win, returned the 11/8 favourite. Tom Scudamore took the honours in the S V Harvey Mares’ Handicap Hurdle when he delivered Molliana to win for trainer Neil Mulholland. The 7/2 chance produced a good leap at the last flight and raced away to score from former Fakenham winner Bisoubisou. And Scudamore and Mulholland later completed a double when Niblawi lowered the colours of favourite Raising the Bar to take the finale, returned at 7/4. It was a great effort by the trainer, with Niblawi returning to action for the first time in nine months. The day’s second chase, the Shereford Handicap Chase, went to the Sarah Humphreys trained mare, Stonebrigg Legend under Charlie Deutsch. Always travelling well, she passed favourite Primal Focus and the two-stone weight difference told in favour of the 13/8 chance who won by more than three lengths. It’s good to know that horses running at Fakenham will handle the tight track and for this afternoon’s feature race (Monday, March 4) three of the six runners return having previously won in north Norfolk. The £17,000 Fakenham Skips Handicap Hurdle at 3.10pm is the highlight of a six-race card and favourite will be the Christian Williams trained Uno Mas. A five-year-old gelding, Uno Mas, ridden by James Bowen, won at Warwick a week after scoring at Fakenham over today’s course and distance. He had also scored at Catterick in January. Kilbrew Boy, a six-year-old under Kielan Woods for Ben Case, won at Fakenham in December over a shorter trip while Canyon City, trained by Neil King and partnered by Bryony Frost, was an October Fakenham winner. While that trio have chances, beware of James Eustace’s Wind Place and Sho. The gelding refused to start at Huntingdon recently having previously finished runner-up at Fakenham. Trainer Williams, from Bridgend in Glamorgan, has been making successful raids at recent Fakenham meetings and he has a chance in the 2.40pm three-mile chase with Conas Taoi under Paddy Brennan. The horse was a Carlisle winner in February and has a stable mate running, Fifty Shades, a grey gelding who was a recent Catterick runner-up. Williams has two of the seven runners as does Wymondham trainer Caroline Fryer who has Frost on previous Fakenham scorer Midnight Bliss and Fergus Gregory aboard veteran Riddlestown. The Shereford Chase at 4.15pm sees Sara Humphrey turn out seven-year-old mare Stonebrigg Legend under Charlie Deutsch who looks to have Alex Dunn’s Truckers Tangle, a Ludlow second, as her main rival. Top trainer Nicky Henderson has sent two for the 4.50pm finale, the novice hurdle, with Nico de Boinville on Raising the Bar, fourth in a higher grade at Sandown, his first run since a wind operation. Henderson also runs Lyndsays Lad under Jeremiah McGrath. Trainer Olly Murphy could get off to a winning start with Swaffham Bulbeck in the opening 2.10pm maiden hurdle under Aidan Coleman. The gelding was second over course and distance on New Year’s Day. Zanzi Win under Gavin Sheehan for Harry Whittington looks the danger. The 3.45pm handicap hurdle looks open and could go to Tom Scudamore aboard Neil Mulholland’s Molliana, recently fourth at Plumpton. Selections: 2.10pm Zanzi Win, 2.40pm Conas Taoi, 3.10pm Uno Mas, 3.45pm Molliana, 4.15pm Truckers Tangle, 4.50pm Raising the Bar. It may be a 500 plus mile round trip when trainer Christian Williams brings his horses from Glamorgan in Wales to Fakenham, but the young handler doesn’t let that stand in his way of searching for winners. For Monday’s six-race card, (March 4), Williams returns to north Norfolk with two recent course winners as he tries to continue his most successful spell since starting as a trainer in April 2017. Second in the 2005 Grand National, Williams, as a jockey, rode more than 100 winners for trainer Paul Nicholls, including three on Denman. Now he is making a name for himself as a trainer since moving to new premises at Ogmore, south of Bridgend. In the 3.10pm feature, the £17,000 handicap hurdle, Williams returns Uno Mas to north Norfolk, the five-year-old gelding a winner over course and distance on February 15 before scoring a week later at Warwick. Among his rivals could be Nicky Henderson’s gelding Lomachenko, fourth at Kempton in January after a Christmas success at Leicester. Williams has two recent winners in the 2.40pm Spring Handicap Chase in Sideways and Conas Taoi. The former was third at the course at the last meeting having previously won at Fakenham on New Year’s Day. mConas Taoi, a 10-year-old gelding, won at Carlisle last week having previously been runner-up at Market Rasen. There is a strong initial entry of 98 runners for the meeting which starts at 2.10pm with a maiden hurdle in which Olly Murphy has Swaffham Bulbeck, last seen on New Year’s Day when finishing second over course and distance. The 2.45pm Toftrees Mares’ Hurdle has attracted a big initial entry with Sam England’s Gold Runner, an Ayr runner-up early in February, and Phil Kirby’s Lady Kyria catching the eye. Lady Kyria was third last time, at Newcastle. The second of the day’s two chases is the Shereford Handicap Chase at 4.15pm in which Sara Humphrey has seven-year-old Stonebrigg Legend. The mare was third at Warwick, having been a Fakenham runner-up in January. Truckers Tangle from Alex Dunn’s yard is also of interest, the gelding a recent runner-up at Ludlow. The finale at 4.50pm sees Murphy with Chez Hans and Colloney entered, both last time winners, while Venetia Williams has Chambard, a Ludlow runner-up after an Exeter victory.